The only constant in life is the ever-changing transition. It’s a well-known truism. Or, as the French put it sometimes plus ca change plus ca reste la même chose. It’s an apparent contradiction but the basic meaning is the same. When Stick launched his blog roughly 20 years ago and a bit later the readers submission it soon became a weekly tidbit for many, me included. First his own weekly contribution and later the readers submissions. Some of them authentic gems. Especially the sub that according to Stick started it all You Saved My Marriage from July 2001. Many others in the wake were to follow and well worth reading. Later the inevitable ‘bargirl did me wrong’, ‘tuk-tuk/taxi driver cheated me’, ‘I was overcharged in restaurant’, ‘built a house in Isaan only to be thrown out after completion’. Other jokers who invested their life savings and lost it all when bargirls turned out to be gold-digger’s. The repeated double pricing topic. But also the more amusing ones about the prettiest go-go dancer or bargirl that later turned out to be a ladyboy in the hotel room. I suspect most of these subs were written by 20 to 40 year olds. These guys are now in their 40s and 60s and while they may still be enjoying the soapies, go-go dancers and bargirls their main interests have almost certainly shifted to other topics. The Stickman site itself has also morphed from the original nightlife guide into other, somewhat new territories. Sticks own retirement or half retirement from the site and the drop in readers submissions have also contributed to the changing times. In his original guideline to submissions Stick indicated at the outset that they should be of readers’ experiences in Thailand and neighboring countries. But there were some exception. One that got away sometimes with this mantra is Phet’s stories who occasionally ignored the rule. Although I have no interest or knowledge in the foundry trade in England’s heartland I’ve read them all mainly because Phet is an excellent narrator. But to be honest I still do prefer his tribulations with girlfriends, wife, ex/new girlfriend, reconciliation with wife and the story no doubt will go on. My contribution this time also deviates somewhat from the norm to a sector dear to me, the culinary art. Not at first sight anything of interest to Stick readers but hang on, the Thai connection will come in the later part. When, weeks ago, I read of the premature and voluntary departing of Anthony Bourdain in a small Auberge in Alsace, France I was sufficiently intrigued to buy his book ‘Kitchen confidential’ also written about 20 years ago. I had occasionally seen one of his programs on a food channel or later on CNN. To be honest I had never been a fan of his and watched mostly when nothing else was at hand. The book that he calls correctly ‘adventures in the culinary underbelly’ is liberally spiked with drug and alcohol binges, not to mention profanities but nevertheless an interesting read. If half of the related stories are true I’m not too surprised at his premature departure even though I have no information on details or what exactly led to it. The second reason of my interest in food and cooking comes from my upbringing. My father who by trade was a baker added to his simple and basic Bakery shop a modest Tea-room after WW2 had ended. It soon became a familiar get together for local Ladies to have afternoon Tea and fancy cakes. The soon growing economy incited my father to expand. Later when workers on the nearby sewing machine factory took their lunch break he soon introduced another niche. That’s serving simple lunch dishes like pâté en croûte garni, bouché a la reine or aspic meat gelée dishes with toast or garlic bread. But now to Thailand. When I arrived 30 years ago I was like most people smitten by Thai food. As often happens to newcomers in a strange land there was a lesson to learn. So, quite naturally I fell into the trap of the tuk-tuk guy who knew of the absolutely best Seafood restaurant in town. Naturally disappointed we paid a premium price for what was at best a medium quality leftover fish from nearby hotel of the past weekend. Another time I vomited for 2 days after consuming spoilt shrimps and shellfish on a makeshift food stall on Pattaya beach road. Yet on another occasion I was served tough, overcooked so-called Australian steak that likely was the produce of an obsolete buffalo that had had his days pulling charts somewhere up in Isaan. Am I trying to put you off eating in Thai restaurants? Go to Mac Donald’s or KFC to be sure on the safe side what quality & cleanliness is concerned. Something often heard by over-cautious travelers. Absolutely not. In the contrary. Longtime residence in LOS will know the places to go or to avoid. For newcomers and travelers there are food/restaurant related sites on the Internet that will give you generally valuable and honest advise on the matter. But it is not fool prove. TripAdvisor, perhaps the best known guide in the matter, has been subject to controversy or downright fraudulent reviews. 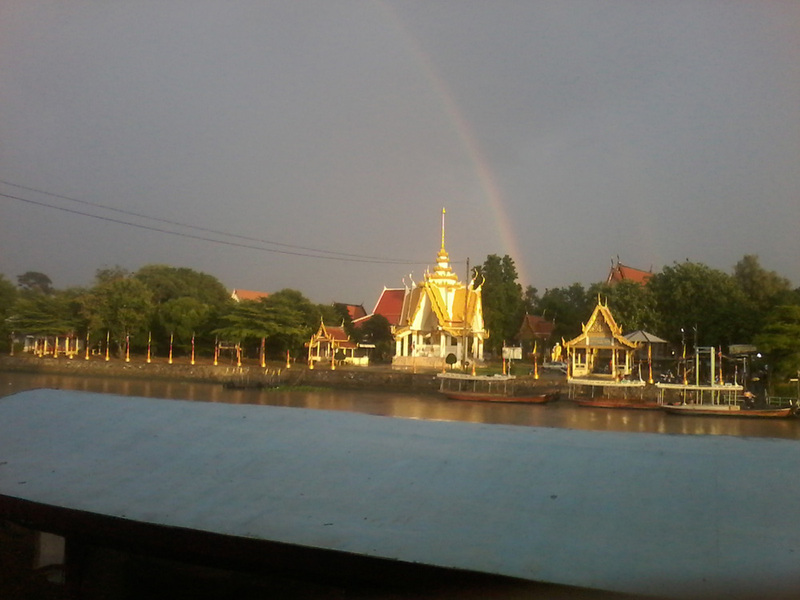 Here’s an example of a most enjoyable evening spent very recently at sunset in a pleasant restaurant next to the Chao Phraya River in Ayutthaya. Some of my preferred and typical traditional Thai dishes were served like poo-Nimm (ปุนิ่ม), Kung og Wunsen (กุ้งอบวุ้นเส้น), vegetables, rice and 3 bottles of local beer for a total of less than a 1000 Baht for 2 persons. Hundreds of similar places around the country. A little friendly banter at your hotel reception will gladly guide you there. If you have the means to frequent a top-end eatery often on a high floor of 5 star hotels you will obviously be save for cleanliness, first class service etc. But naturally pay the price for it. If you plan an event in such an établissement you may on demand meet with the responsible head chef. He may not be of the caliber of Bocuse, Troigros or Girardet but certainly competent to discuss satisfactorily your needs and requirements. Few only would look for this kind of venue. Follows three examples of restaurants that I can seriously recommend Please keep in mind that I’m not a Restaurant critic and in no way involved with these places other than as simple customer. These restaurants serve good food at very reasonable prices. There is no hierarchy and no star cooks in these places at best a superwiser or two. Food, dishes are prepared by what Anthony Bourdain calls line cooks in his book. Or to use another term worker bees. Food is prepared and served following exactly established recipes. Assisted naturally by modern kitchen utensils, Microwave ovens, pre vacuum-packed produces that naturally allows to offer the large display of offerings and does in no way diminish the quality of the dishes served. 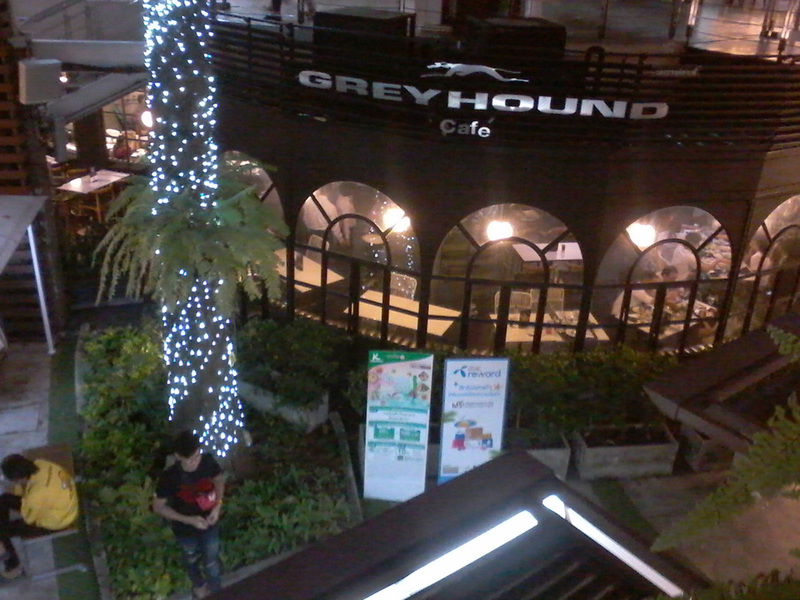 Greyhound café: There are I believe a dozen Greyhound restaurants in greater Bangkok and one in each Hua-Hin and Pattaya. They call themselves Asian Fusion Restaurant which may be a bit deceptive at times. The menu is rich in Thai and international dishes. Due to the location where I live the one I favor is at Ari BTS Station especially evenings (photo). Occasionally I will stop by the one in Central Chidlom also easily accessible direct from the BTS station as are the branches in the Siam and Central Word areas. Both the quality and large variety of dishes on offer plus service deserve good grades. Most customers are Thais therefore the servings are not as large as in the farang oriented restaurants. That suits me just fine as I eat small portions nowadays and do not like to leave half eaten plates go to waste. Some have said that prices are high but I disagree. Food quality and efficient service justify the prices. 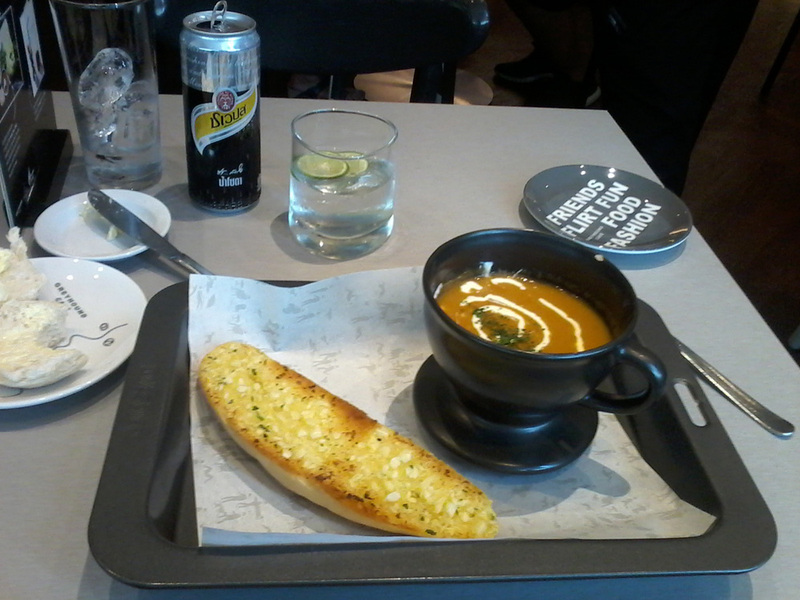 As an example a Bisque with garlic brioche cost 180 Baht (photo). I can recommend Greyhound cafés in Bangkok. Happy hour from 6 – 9 pm. Sizzzler: If you’re like me you will occasionally feel the need to savior a good steak. Not easy to find here. Sizzler will serve a perfectly cooked or grilled steak to your personal taste with the required accompagnement, baked potatoes, French fries, rice etc.) Add to that a really very rich and always well stocked salad buffet and usually attentive service. No problem taking your Thai friends here they will find plenty of dishes to their liking. The Siam Center branch is my favorite one. 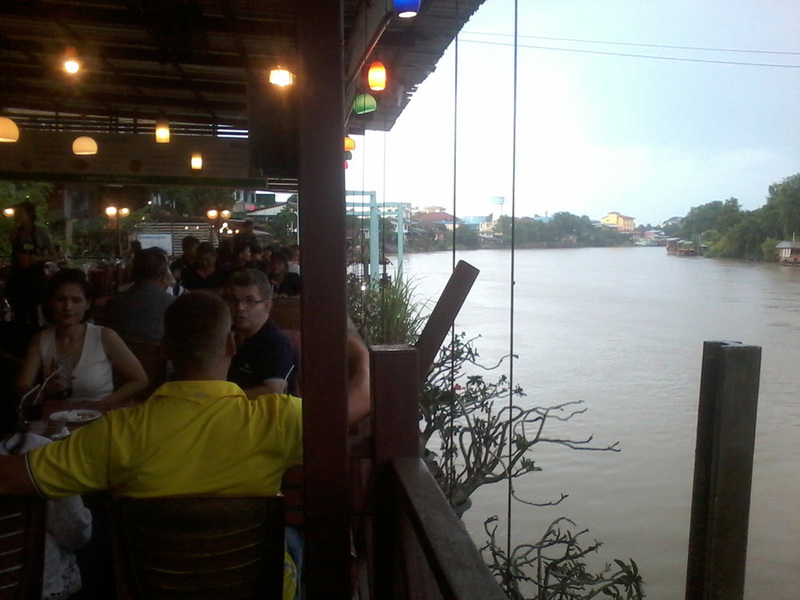 Although it is very large it’s mostly full up after sundown and surprisingly so mostly by young Thais. I have taken to go early to find a seat by the window. Also being in the tourist center and a regular client I also get my glass of red wine anytime. (No European will eat a succulent steak without a glass of red). Also 12 or more branches in greater Bangkok I believe. No happy hour. Foodloft Central Chidlom: On the top floor of the famed shopping mall. Not easily to find but located in the familiar shopping mall. It’s accessible by elevator or by several flights of rolling staircases. This place offers country oriented food stalls; Thai naturally but also Chinese, Korean, Vietnamese, French, Italian. Order your desired food at the respective stall and have it served at the large, 2 stories dining area. Additionally a well-stocked desert counter with many tempting sweets from around the world. Apple crumble with vanilla sauce or the tasty Rum-raisin ice-cream and Espresso are my favorite in this department. Payment is made easy here by toping up the account card handed to you when entering the dining area and summed up for payment on leaving.